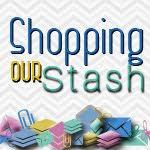 Thanks for coming by today to check out the latest challenge from the SHOPPING OUR STASH crew! This week our theme is Project Runway - we want to see fabric of some sort on your project whether it be actual fabric, fabric tape, fabric embellishments...whatever fabric-y thing you have in your stash. I was lucky enough to be gifted a whole whack of fabric pieces by my pal Jessi so I happened to have some that worked perfectly for this challenge! While you are there, please share some crafty loves with the rest of the crew. Yep, love everything about this! YES! Love the vintge girls with the polka dots... perfect! Black, white, and red... everything about this card flows! 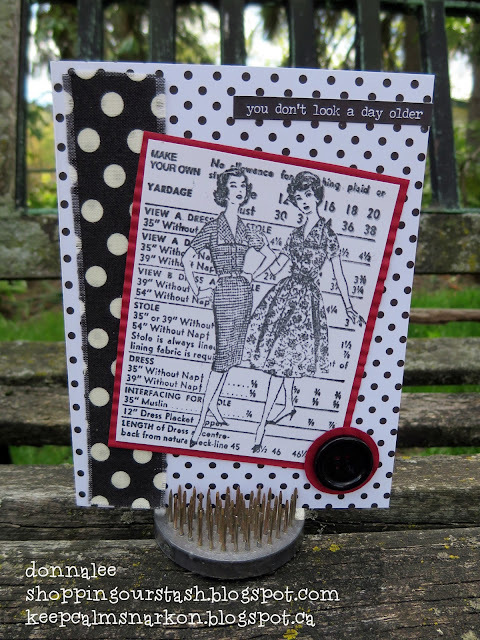 I love the images of this vintage ladies, they remind me of the patterns my sweet maternal grandma used to have in her sewing room, fabulous monochromatic look on this card with a splash of bright red.